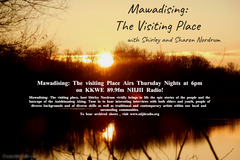 Shirley and Sharon Nordrum vividly bring to life the epic stories of the people and the landscape of the Anishinaabeg Aking, interviews with both elders and youth, people of diverse backgrounds and of diverse skills as well as traditional and contemporary artist within our local and surrounding communities. Hear more about Anne Dunn, Author, Story Teller and Artist! Shirley talks with Musician, Mel Hunt from Onigum, Mn.